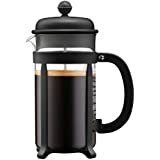 Amazon's Choice for "french press travel mug"
Sold by JavaPresse Coffee Company and ships from Amazon Fulfillment. 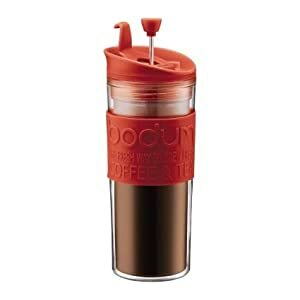 Enjoy a single-serving of French press coffee or loose leaf tea on the go with Travel Press Coffee Makers and Travel Mugs! Brew and drink or use in the place of a traditional 3 cup French Press. 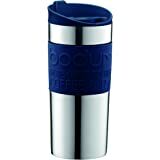 The stainless steel double wall design with a vacuum seal maintains heat for hours while remaining cool to the touch. After 4 minutes press down the plunger and enjoy. 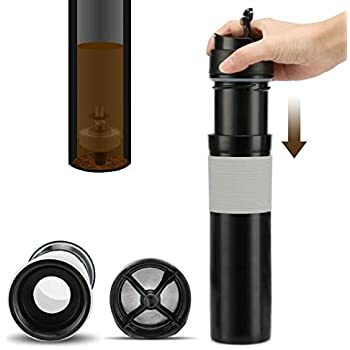 Silicone and mesh filter reduces sediment. 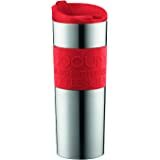 Stainless steel double wall design with a vacuum seal maintains heat for hours while remaining cool to the touch. Non-skid rubber base and comfortable, ergonomic grip with colorful silicone band. 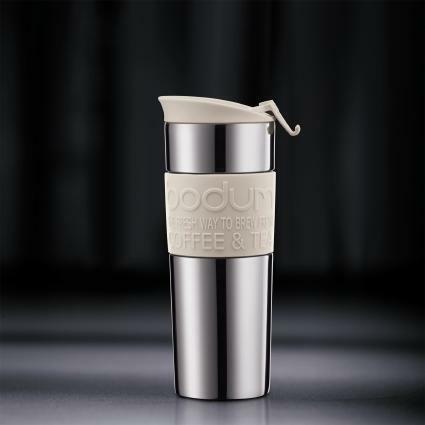 Perfect for any beverage on the go. 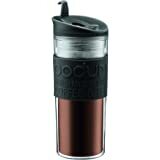 Made of double-wall BPA-free plastic and keeps beverages hot or cold for several hours. Ergonomic grip with colorful silicone band. 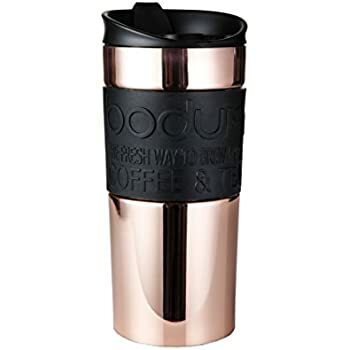 5.0 out of 5 starsBe smarter than the mug people! 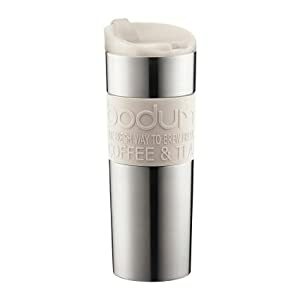 So many reviewers are complaining about this thing keeping coffee too hot and adding cream/sugar through the drink hole. Here's the super secret process to get around those inconveniences: First add coffee grounds. Then add hot water. Wait a few minutes. Add sugar. Add cream. Add one ice cube. THEN place the top on and plunge. You're Welcome. I’ve been hoping to get a combination coffee press + thermos like this since I first discovered that they exist. 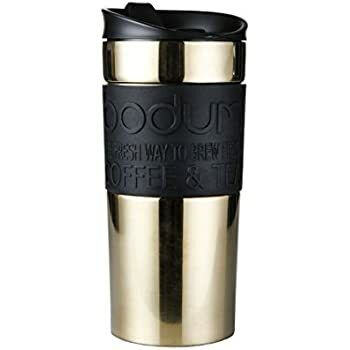 I’m always in an enormous rush in the morning and I always need coffee, so this seemed like an economical and time efficient way to make coffee. 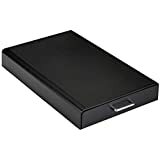 I ordered this to an Amazon locker - they’re super convenient in Boston, good for travelers without stable addresses and seem to prevent any possibly of mail theft. 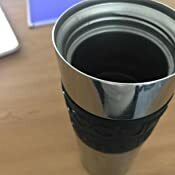 The thermos was in excellent condition and I was eager to use it. 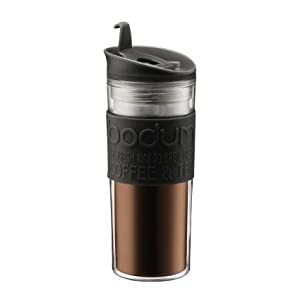 Overall, would recommend for busy coffee drinkers! 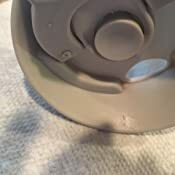 Purchased the item three month ago.. About a month into usage, the plastic around the mouth piece of the press started peeling and I stopped using it. 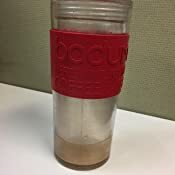 I contacted Bodum about the problem and asked whether they can replace the press part alone. The company never responded to me. 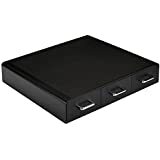 I will contact Amazon and see if they have any suggestions regarding a replacement part. Otherwise it was a big waste of money. 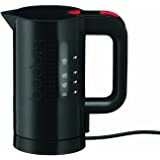 It even hardly keeps the beverage hot. Don't buy this product! 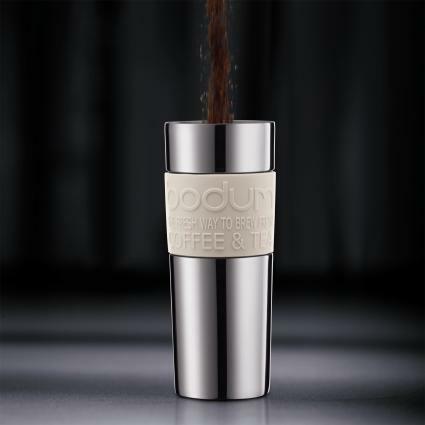 5.0 out of 5 starsSolid press, stainless steel version delivers tasty java to your mouth-hole! I'm coming from an older Planetary Design coffee press. Since I am going to be traveling again, I decided to buy another press and figured this one was good to go. It is super solid. 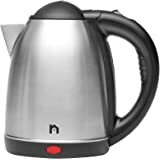 Stainless steel was the way to go. 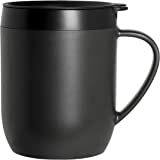 The top part of the mug is a durable plastic. The inside has the press, metal filter with a soft silicone-like gasket to make sure no grinds get through. And so far, nothing has gotten through. My Planetary Design press that I love has an additional mesh in the spout to further block anything that may get by; this press does not have this. I have yet to drink any grinds, though. I was so excited to receive my mug based on the reviews, but I am still searching for a tea mug I can take on the go. 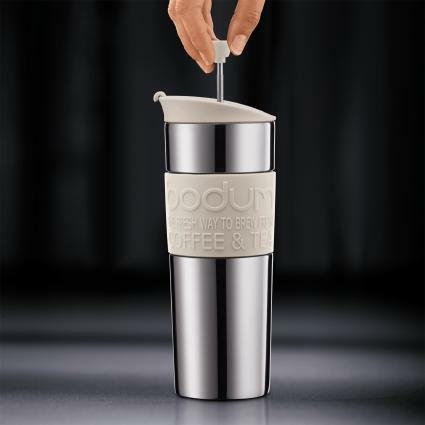 The mug is comfortable to hold and a sleek design. I have main "complaints" though, first is minor, as with any tea infuser. If I move the plunger up and down while steeping, some leaves can get into the main part of the mug. No biggie, that is a function of how I use the mug. 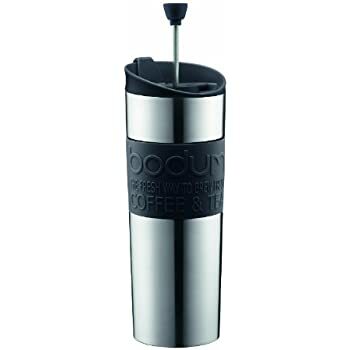 My bigger dislike is the plunger only goes so far down into the mug, and the seal is so tight when it is at the stopping point, any liquid below this point cannot come up, therefore wasting nearly an inch and a half of liquid at the bottom. It is great the mesh filter is so great, but that is why I need to move the plunger when it is steeping, as it down not allow liquid to flow freely from where the tea is. 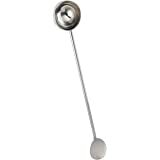 Given a typical cup of tea or coffee will only need 1 TSP to 1TBSP, I would have thought the plunger would have gone further down like it a typical press. All in all, not bad, but I am looking to replace it for these reasons already. 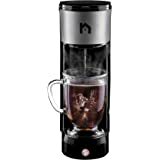 5.0 out of 5 starsBrings out the full flavors of coffee or tea. 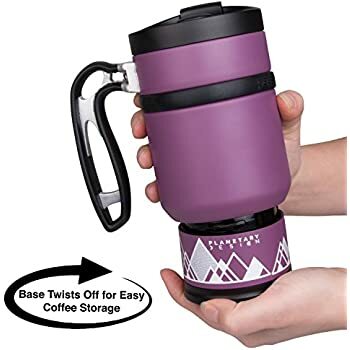 This coffee press is perfect for home and travel, and it keeps the beverage hot for two or maybe three hours and still warmer than luke-warm after that, as long as you keep the top closed. People complain of tea or coffee grounds in their mouth as the level lowers, but I use a method that prevents that. 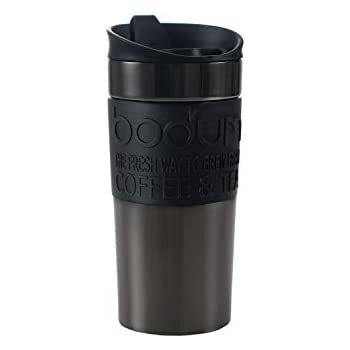 After letting the hot water in the bottom set for a few minutes (see instructions that came with the press), fill with water to, but not over, the FIRST RIM that the water comes to within the cup. I don't know what it's called, but it's the rim below the spiral where the lid is twisted on. 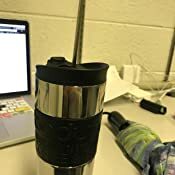 The mesh of the plunger perfectly fits it without space between the plunger and the cup. Before placing the lid, pull the plunger up on the lid and carefully place it in the cub straight so that the mesh is not at an angle, but perfectly in line with the sides of the cup so that grounds do not sneak between the mesh and the cup. 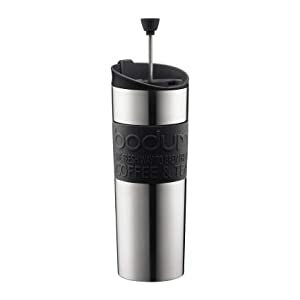 Lower the lid, but not the plunger, onto the cup and screw on. When the lid is screwed on, VERY SLOWELY push the plunger. As soon as you feel any resistance, pause and gently tap the side of the cup a couple of times. Continue depressing the plunger, and when you again feel resistance, pause and gently tap the side. Keep doing that until the plunger is locked all the way down. You should not receive a mouth full of grounds or tea when you drink to the bottom. 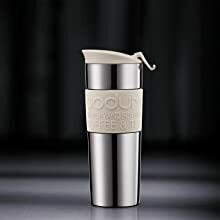 I absolutely loved this cup, I recommended it to everyone that would listen. 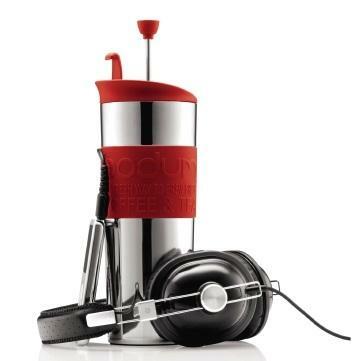 A french press that I can drink out of, what's not to love??? Until one day I got a few grinds in my coffee. Then a few more. Then it was undrinkable, I'd guess at least a teaspoon of grounds made their way through. Coffee down the drain, sad day. Needless to say, the cup found the trash can and I'm back to my old ways of brewing and pouring into a coffee mug. It was an amazing product for the four months or so that it lasted.